There are 30 million Americans who are over the age of 20 that are lactose intolerant, according to the National Institute of Health. After drinking milk, those who are lactose intolerant suffer from stomach cramps, feeling bloated and even diarrhea. Lactose is found in cheese, milk and other dairy products, and is the sugars that are in these products. When a person is lactose intolerant, their small intestines is not able to break the sugar down, which results in the person feeling unpleasant. The condition is very common, especially for those who are Asian, Native American, African or have Mediterranean ancestors. Though the issue is one that can cause pain and be unpleasant to have, it is most often not considered very serious. Those who have lactose intolerance have an issue in which the small intestines are unable to break down the sugars found in dairy products, which is called lactose. 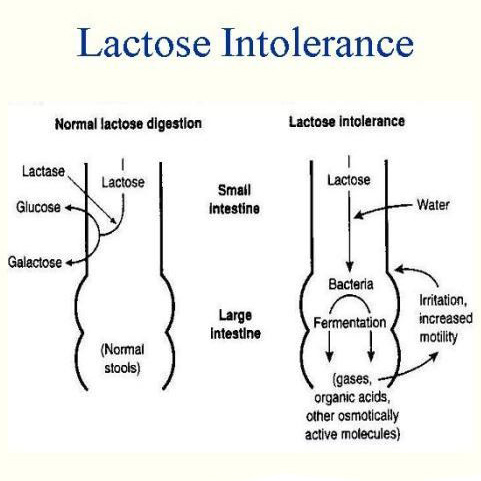 The small intestine is not making enough lactase, which is an enzyme that breaks down the lactose. Due to this, the lactose moves into the large intestines, which causes the bloating, diarrhea and gas, which people with lactose intolerance deal with. Aside from being called lactose intolerance, many people are labeled as lactase deficient. Those who have lactose intolerance or are lactase deficient often see the results of this condition within 30 minutes to 2 hours after eating or drinking dairy products. Keep in mind that having an allergy to milk or dairy products is not the same as being lactose intolerant. Those with allergies often have itching or hives after coming into contact with this, while those who are lactose intolerant develop stomach issues. If a person has these symptoms for a while, they can possibly become dehydrated due to the diarrhea they are experiencing. However, this is usually rare in patients with lactose intolerance. When a person starts to notice these signs or symptoms, they are going to want to see a doctor if these symptoms are not improving on their own or they are getting worse. For those with infants who show signs of lactose intolerance, they need to go to the doctor, especially if the child is not gaining weight or growing as they should be. Also consider calling the doctor if you are looking for food substitutes that are not going to contain dairy, yet still offer nutritional value. What Are the Causes and Risk Factors for Lactose Intolerance? There are basically three causes for lactose intolerance. The first is congenital which basically means a person is born without the gene that can process lactose in foods or drinks. This is relatively rare, but it requires immediate attention, as it can affect the growth of the child. The second type is called a secondary cause of lactose intolerance. This cause is due to other diseases that may be causing the small intestine to malfunction, thus it affects the ability to produce lactase. An example of a disease that can cause lactose intolerance is celiac sprue. The final case for lactose intolerance is developmental. With this type of cause, the older the person gets, the less likely they are to be able to process dairy foods and/or drink. This is the most common cause for lactose intolerance, as more adults are affected than children. There are several factors that can put a person at risk for having or developing lactose intolerance. Many times when a person has an already existing digestive issue such as Crohn’s disease or celiac disease, they will develop lactose intolerance due to the disease. There are several medications that can cause the lactase enzyme to slow down or stop completely. Usually these medications are in the antibiotic family. Adults tend to become lactose intolerant when they become older due to their bodies no longer producing enough of the lactase enzyme, which is the normal course of things. The ethnic background of someone can mean that they are at an increased risk of developing lactose intolerance. For example, those who have Native American, Mediterranean descent, Asian, African and Hispanic backgrounds are more likely to develop the intolerance. There are times in which some infections can cause lactose intolerance. For example, if a person were to have an infection that results in diarrhea, they may find that they are no longer able to tolerate dairy products. You should also make sure that you are getting enough Vitamin D to improve the absorption of calcium.